Location: Le Perthus, in the Pyrenees-Orientales departement of France (Languedoc-Roussillon Region). 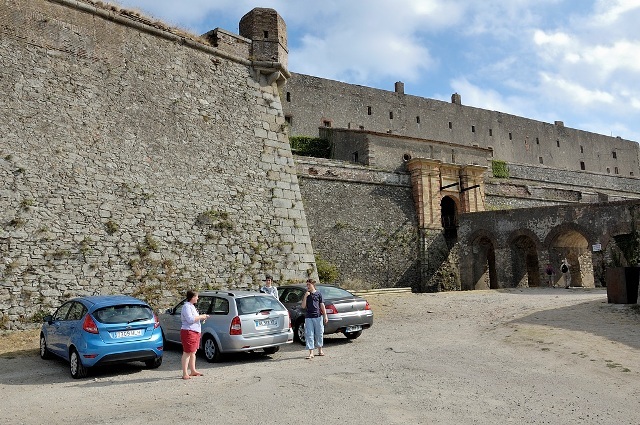 Notes: Fort de Bellegarde is a fortification of the seventeenth century on the border between France and Spain, above the town of Perthus, in Pyrénées-Orientales. It then serves to control and defend the Col du Perthus.Bellegarde The story has its origins in the kingdom of Mallorca. In 1285, when this kingdom existed for less than ten years, Peter III of Aragon was a very serious threat to the young king Jacques II of Majorca. To defend himself, he built a watchtower above the Perthus, equipped to defend themselves independently. But she remained a simple watchtower, with its 20 meters high and thick walls of only 1.5 meters.When, during the fourteenth century, King of Aragon took its neighbor militarily, the tower was abandoned a royal standpoint, it no longer served that lord of the region to require travelers to pay a customs duty . Le Perthus become a French territory after the Treaty of the Pyrenees (1659). During the War of Holland, Bellegarde is taken by Spain May 8, 1674, then restored by Frederick Armand Comte de Schomberg after ten days of siege, July 29, 1675. In 1679, Vauban visited Bellegarde and endorses the considerable expansion plan proposed by his Christian Rousselot engineer Monceaux. It makes corrections, including providing instead a double fortification. The following year, Louvois accepts the bulk of the project. Work is engaged.